Narrating Life: First I published this post without a title...what's that all about? First I published this post without a title...what's that all about? My sweet sister-in-law has finally laid the smack down on us to get truckin' on our blog about the Great Cupcake Tour of Denver 2009. I'll be working on that this weekend but I thought I'd treat those of you who don't read my family blog to a cupcake teaser post. Enjoy! Our dear friend Rachel graduated from the Regis Nursing Program on May 1. For her graduation party she asked if I would be interested in helping her make cupcakes and plan decorations. 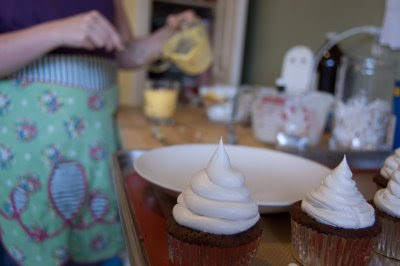 I was deeply flattered and immediately suggested we try these hi-hat cupcakes that I had been dying to make. They were a beautiful success! Rachel snapped this lovely picture while we were making the cupcakes the day before the event. The topping is meringue that you pipe on and then DIP UPSIDE DOWN into MELTED CHOCOLATE to coat the outside. Nerve-wracking I tell ya. And of course, our most avid of cupcake eaters declared them: DELICIOUS. Congratulations Rachel! We're all proud of you. My mouth is seriously watering to the max. And congratulations, Rachel! I've seen those cupcakes and wanted to try them, but... how heart-stopping is it to turn them upside down and dip them?? Your piping looks great. I used to be good at it but now I'm not. I don't know what happened. Anyway: WANT. Those cupcakes look amazing! Your mad baking skills are impressive indeed. I like the idea of yellow dipping to be more thematic. My jaw actually dropped when you mentioned the part about dipping the cupcakes in chocolate! Sham. Wow. And congratulations to Rachel! That's such an accomplishment!